Here's a little trick: Instead of focusing on “making money,” focus on creating value and the money will come. If you wait until you're ready, you'll be waiting for the rest of your life. 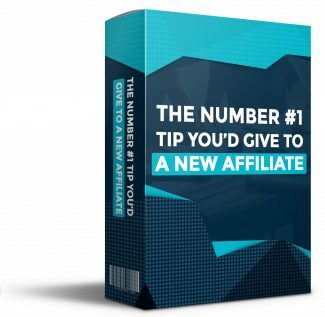 Are you still “getting ready” to be an affiliate? Make the decision to just do it. So what if your website isn't perfect or your emails aren't perfect? I'll let you in on a little secret: They never will be, no matter how long you wait. So just jump in and start swimming – the water's fine! Do it with passion. You can be an affiliate in ANY niche – so why not choose a niche you're passionate about? It's far more fun to review a product or write a blogpost on a topic you love, rather than one you feel complete and total ambivalence for. Watch out for the picture in your head. You imagine sending out one email and getting a 50% response rate, or doing one PPC campaign and raking in $10,000. Then it doesn't happen. Then you get discouraged. Then you procrastinate. And pretty soon you're out of the business entirely. Why? Because reality didn't match the picture in your head. Here's the news: That picture in your head is what you're shooting for – it's not what's going to happen the first day or maybe even the first year out of the gate. Like anything else, you work your way up in affiliate marketing. You get better. Your list gets bigger. Your website gets more traffic. You become more attuned to what works and what flops like a dead mackerel. And one day, you finally match that picture in your head. But it doesn't happen overnight. Worrying won't change the outcome. You write an email to your list and you worry you're saying the wrong thing, you worry you'll make a stupid typo, you worry no one will open it, you worry no one will buy the product you're promoting, you worry you'll get hate mail or everyone will unsubscribe... etc. Thinking you're too late. There are affiliates out there making six figures a month – maybe seven figures. You should have jumped on the affiliate wagon 10 years ago, now it's too late. Right? “If you think you are too small or too new to be effective, you have never been in bed with a mosquito.” That's a quote from Betty Reese. Mosquitoes only live for two weeks – guaranteed they don't worry that they're “too late” to bite the bejeebers out of you – they just DO it. Think of it this way - Those who went before you have laid the ground work for you to be successful. Comparing yourself. This goes right along with thinking you're “too late.” If you're trying to compare yourself to the mega-watt affiliate who pulls down six figures a month, you're just hurting yourself. “Comparison is the thief of joy.” -Theodore Roosevelt Knowing and doing are two different things. Getting your first affiliate payment is like getting your driver's license - you've only just begun to become a great affiliate or driver. It's when you're driving your car every day, or getting paid every day, that you'll find you know what you're doing and you're actually DOING it. Focus focus focus. You've got 5 different niches and 7 outstanding ideas and you're going in 12 different directions at once. Know what happens when you pull someone 12 different directions, or even just TWO different directions? They either don't move, or they get pulled off balance. Optimize for ONE search engine. If SEO is your method of traffic generation and you optimize your website for Google, don't get smart and then optimize your website for Yahoo or Bing – you'll get penalized for this by Google. No, it's not fair, but it is fact.